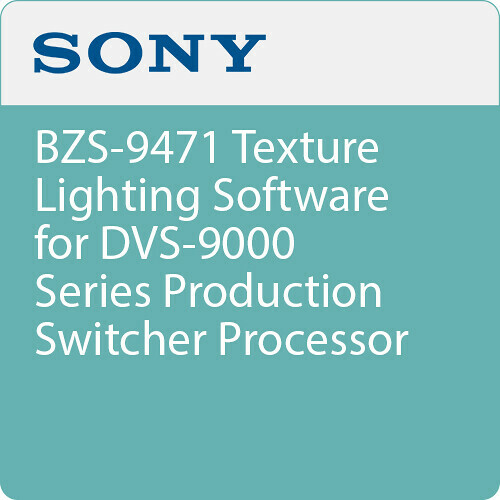 The BZS-9471 Texture Lighting Software from Sony adds the texture lighting function to the DVS-9000 Series Production Switcher Processor. This function enables you to map a texture pattern onto a DME effect using the spotlight function. The Real Lighting function can add realistic lighting to several non-linear effect patterns. Up to 4 light sources are available per DME channel. With the Test Sphere function, the position and brightness of light sources can be confirmed with ease. It’s an advent of a new generation in creative programming for broadcast stations and post-production facilities. Note: You require a DME board set (sold separately) to be installed with the switcher processor.